Monday March 7th 1881 I gave the house a good cleaning up this morning and helped wash the dinner dishes as Bridget had to wash. I went over town and did a little shopping and walked up to see Ella Bird where I had a pleasant visit I came back to Winnies after supper and Lee came there for me I had a letter from Cousin Jennie today. John went to Burlington Tuesday March 8th 1881 Mother went down to Uncle Jims to his birth-day party I was busy about the house all the forenoon and was sewing in the afternoon and evening for May. 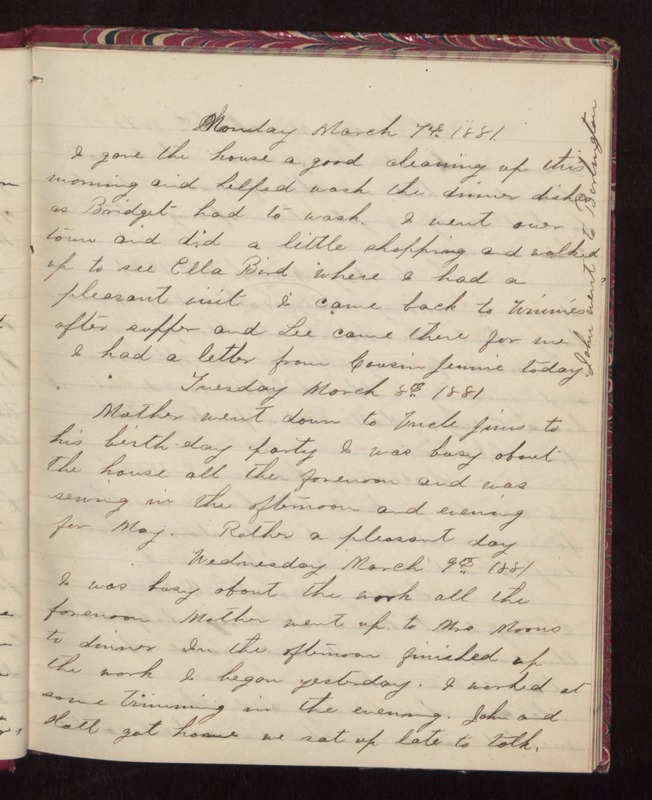 Rather a pleasant day Wednesday March 9th 1881 I was busy about the work all the forenoon Mother went up to Mrs Moons to dinner In the afternoon finished up the work I began yesterday. I worked at some trimming in the evening. John and Hatt got home we sat up late to talk.